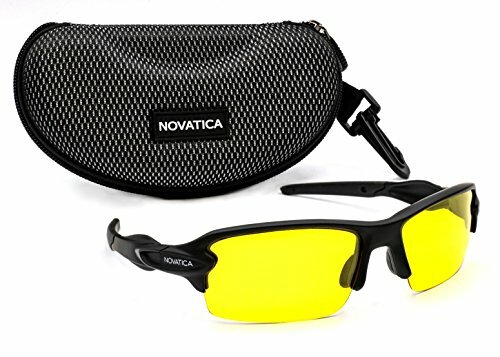 NOVATICA Anti-Glare Night Driving Polarized TAC Glasses – HD Vision - UV 400 Protection - Sport Sunglasses for Men and Women – Yellow Lenses and Durable TR 90 Frame for Outdoors and Accessories by NOVATICA at SFCPA. MPN: NVDG001. Hurry! Limited time offer. Offer valid only while supplies last. NOVATICA brand is a family owned small business located in East Coast of the United States. We design and offer sunglasses to suite your lifestyle. NOVATICA brand is a family owned small business located in East Coast of the United States. We design and offer sunglasses to suite your lifestyle. Anti-Glare Polarized sport sunglass equipped with High Definition Polarized, UV 400 protective layer, Yellow TAC lenses and TR 90 durable frame. We value your user experience with our sunglass and your satisfaction is our success. NOVATICA high performing anti-glare polarized sunglass will protect your eyes all day long. ANTI GLARE PROTECTION WITH HD POLARIZED TECHNOLOGY THROUGHOUT THE DAY: Glare from shining objects could come any time during the day or night. Headlights from oncoming vehicles, reflections or direct sunlight could obstruct your night driving ability. Cyclists know how glare can harm their visibility, strain and blur their vision. Whether you are shooting indoor or outdoor undisturbed visuals of the targets are vital to have a better shooting experience. Fishing can be challenging when glare from bouncing water distracts you. Hiking, running or enjoying the outdoors you know glare will ruin your day. You would appreciate a sunglass that could ease the distractions and neutralize annoying glare. NOVATICA Anti-glare Sport glasses can be of a great companion to your active lifestyle. Its HD Polarized lenses reduce glare and improve the visual clarity. WHY WORRY ABOUT SUN'S HARMFUL RAYS: Exposing to sun's ultraviolet rays can be harmful. Sunscreen is not enough when you are enjoying perfect outdoors. Shading your eyes with UV protective lenses will reduce the effects of UV related damages over time. NOVATICA sunglass with UV 400 coated lenses reduce the harmful effects of sunrays. NOVATICA SUNGLASS IS A PERFECT CHOICE: NOVATICA thrives to offer best value to our customers and build the brand loyalty for years to come. Our high utility sport ALL IN ONE sunglass is most affordable in its class. If you have any questions about this product by NOVATICA, contact us by completing and submitting the form below. If you are looking for a specif part number, please include it with your message.